Find the right tour for you through Beshisahar. We've got 8 tours going to Beshisahar, starting from just 8 days in length, and the longest tour is 21 days. The most popular month to go is April, which has the most number of tour departures. 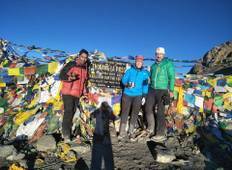 "We were a team of four from from 29th of Aug to 6th of Sept to Annapurna Circuit..."
"Nice. I enjoyed a lot. Keep up the good work." "I highly recommend this company as we did the Annapurna Circuit Trek. We were taken..."
"courteous,well trained guide, decent accommodations made my trip fun,informative..."